Every spring, Prof. (and alum) Jeffrey Wasserman teaches a course on the Principles of Client-Oriented Policy Analysis. The class lets students "explore ways to develop and maintain good client relationships and to conduct 'quick and dirty' analyses that allow the analyst to both meet client expectations and to maintain their personal and professional integrity." As part of the class, students work in teams of three to participate in a short-term project with a local client. 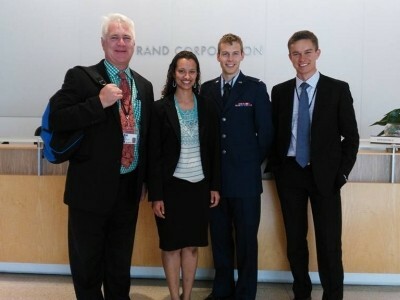 This past spring, Andrew Cady, Jakub Hlavka, and Julia Pollak worked with Tim McCormick, transit planning administrator for the Big Blue Bus, on a project to optimize connectivity to new Expo Line Metro stations in Santa Monica. Specifically, McCormick asked them to identify the neighborhoods in greatest need of improved connectivity to the Expo line. They did so by developing a robust set of performance measures for first- and last-mile bus services to the seven new Expo Light Rail stations on the Los Angeles Westside, which opened on May 20, 2016. The team took a big data approach to the question. They used U.S. Census data to identify areas where residents were likely to use public transit and then, using the Google Maps Application Programming Interface (API), simulated trips between addresses on the Los Angeles Westside and Expo Light Rail stations to evaluate existing bus service. In the process, they identified those neighborhoods where the population’s propensity to use public transit is projected to be high, and yet the simulated performance of the bus systems is relatively poor. Service changes introduced by Big Blue Bus on June 12, 2016, dramatically improved Expo connectivity, reducing the number of areas with poor performance by about 28 percent. 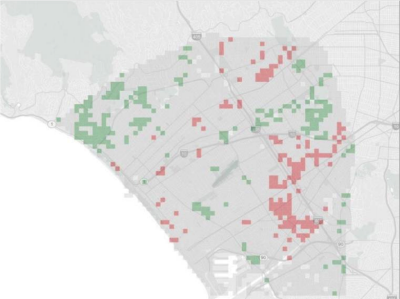 However, areas where gaps still remained included Palms, Del Rey, Mar Vista, and Westwood. McCormick said of the students' research, "Bus routing is an imperfect science because our land use and transportation infrastructure is varied and uneven. The findings in the student report enabled us to better understand where there were gaps in what we had planned. Although we thought we knew the service area, there were definitely surprises in areas we had overlooked. Having this information on unmet need has helped us to better formulate plans for moving forward, relying on fact based assertions rather than our own more broad perspectives. This kind of research is like an x-ray on a patient after surgery. There are things that you just can’t see from the normal way we gather and process data." Wasserman commented, "What I loved about the Big Blue Bus project is that it provides a great illustration of what our students can accomplish in a very short timeframe with the analytic techniques they have learned through their classroom and OJT experiences. In just ten weeks, and knowing virtually nothing about the substance of the problem, the team produced a highly detailed gap analysis of the bus connectivity issue and provided the client with both short and longer term recommendations for improvement. The project also provided them with an opportunity to interact with a sophisticated and engaged client."